In addition to their overexpression in cancer cells, most of the tumor-associated Ags are expressed at low but detectable levels in normal tissues. It is not clear whether the repertoire of T cells specific for unmutated tumor Ags is shaped by negative selection during T cell development. The transgenic adenocarcinoma of mouse prostate (TRAMP) model is transgenic for the SV40 large T Ag (Tag) under the control of the rat probasin regulatory elements. Although it has been established that T lymphocytes from TRAMP mice are tolerant to SV40 Tag, the mechanism of the tolerance is largely unknown. To examine whether the T cell clonal deletion is responsible for the tolerance, we crossed the TRAMP mice with mice transgenic for a rearranged TCR specific for SV40 Tag presented by the H-2Kk. 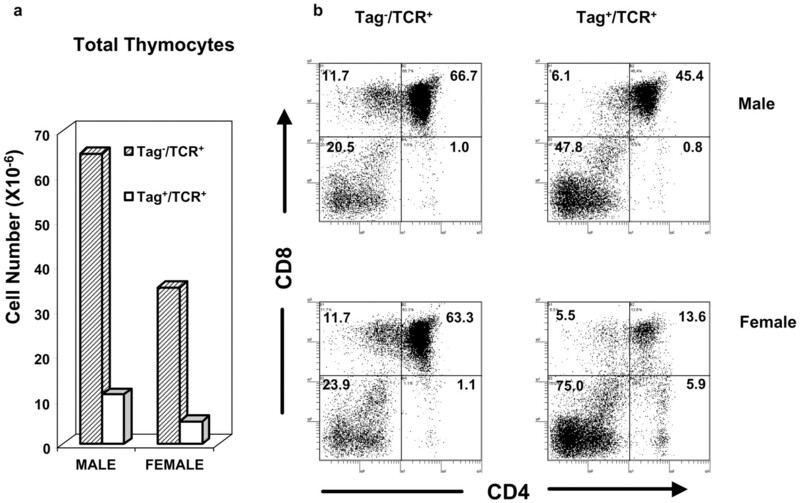 Double transgenic TRAMP/TCR mice showed profound thymic deletion of SV40 Tag-reactive T cells, including a 6- to 10-fold reduction in the total thymocyte numbers and a >50-fold reduction in phenotypically mature T cells. Consistent with this finding, we observed that the SV40 Tag and endogenous mouse probasin genes are expressed at low levels in the thymus. These results demonstrate that clonal deletion is a major mechanism for tolerance to Ags previously regarded as prostate-specific, and provide direct evidence that the T cell repertoire specific for an unmutated tumor Ag can be shaped by clonal deletion in the thymus. The majority of the tumor Ags identified so far has the same sequences as the endogenous genes (1, 2, 3, 4, 5, 6, 7). These unmutated tumor Ags are often recognized by T cells from cancer patients (8, 9, 10, 11, 12, 13). However, with the notable exception of the PR-1 Ag in chronic myelogenous leukemia (10), cancers appear to progress despite significantly expanded CD8 T cells specific for the tumor Ags. It has been suggested that these T cells are either anergic as a result of peripheral tolerance (9) or have low avidity for the cancer Ags (14). In the model of experimental autoimmune encephalomyelitis, it has been documented that T cells in mice lacking the autoantigen myelin basic protein have an increased avidity for this Ag (15). Similarly, T cells from mice with a targeted mutation of tumor suppressor gene p53 (16) or spontaneous mutation to tyrosinase (17) have intrinsically higher affinities than T cells from the wild-type mice. A recent study demonstrated that tolerance to SV40 large T Ag (Tag)3 resulted in unresponsiveness to the dominant, but not the subdominant, Tag epitope (18). Therefore, it is likely that tolerance to self Ags removes T cells with high avidity to the immunodominant epitopes on unmutated tumor Ags. However, it is unclear whether high avidity T cells are removed by thymic clonal deletion or by mechanisms of peripheral tolerance. Sarma et al. (19) examined the negative selection of T cells specific for unmutated tumor Ags using mice transgenic for Ag-specific TCR. The results indicated that transgenic T cells specific for the unmutated tumor Ag P1A develop normally unless the tumor Ag is transgenically overexpressed in the thymus. However, since the transgenic TCR was isolated from a CTL clone that had gone through negative selection in mice that expressed the tumor Ag at low levels, it is not surprising that transgenic T cells escaped clonal deletion. Thus, this work did not address whether the repertoire of T cells specific for the unmutated tumor Ag is subjected to negative selection in the thymus. For this purpose one must start with TCR isolated from mice lacking specific Ag, and investigate the fate of T cells in mice that express this Ag. In addition to being a major Ag, SV40 Tag is a potent oncogene. Tissue-specific expression of SV40 Tag leads to development of tissue-specific cancers, including cancers in liver (20), brain (21, 22), bone (23), and pancreas (24). Recently, Greenberg et al. (25) have described a transgenic mouse model for prostate cancer: transgenic adenocarcinoma of mouse prostate (TRAMP) mouse. In this model, a minimal rat probasin promoter regulatory element sequence was used to target expression of SV40 Tag to the epithelium of the mouse prostate. Because the CTL epitopes for the Tag are among the most extensively characterized (26, 27, 28, 29), many groups have used SV40 Tag transgenic mice directed by various promoters as models to study T cell tolerance to tumor-associated Ag (30, 31, 32). Functional analysis of different lines revealed that transgenic mice expressing SV40 Tag in several tissues including prostate are tolerant of the Ag (30, 31, 32, 33). The tolerance was characterized by significantly reduced numbers and avidity of T cells upon immunization with either intact Tag or mini-genes bearing the Tag epitopes. In one model of osteosarcoma, tolerance developed over time with distinct kinetics for different epitopes (32). In the pancreatic insulinoma model, immune tolerance temporally correlated expression of the Tag in target tissue (34, 35). However, the mechanism for immune tolerance has not been clearly elucidated in these tumor models. Self Ag can induce tolerance by either central or peripheral tolerance. Central tolerance is characterized by clonal deletion (36, 37) or clonal anergy (38) of immature T cells in the thymus, while peripheral tolerance can be mediated by a number of mechanisms including clonal anergy (39), activation-induced cell death (40, 41), and regulatory cells (42). Although significant progress has been made in understanding the mechanism of immune tolerance to SV40 Tag in various tumor models (30, 31, 32, 33, 35), it remains unclear whether clonal deletion or functional inactivation is responsible for T cell tolerance. With regard to the tolerance in the TRAMP model, it is unclear whether peripheral or central tolerance is involved, and whether this is achieved by either clonal deletion or functional inactivation. It has been speculated that peripheral tolerance may be responsible (33), because previous studies have failed to detect Tag expression in nonprostate tissues including the thymus (33, 43). In this study, we crossed the TRAMP mice with TG-B mice (44), which are transgenic for a rearranged TCR that recognizes Tag presented by H-2Kk. We found that double transgenic TRAMP/TCR mice had strong thymic clonal deletion of SV40 Tag-reactive T cells. These results provide the first direct evidence that tumor Ags previously perceived to be expressed exclusively in cancerous tissues can induce deletion of Ag-specific T cells in the thymus. C57BL/6 mice and TRAMP mice expressing the SV40 Tag controlled by rat probasin regulatory elements in C57BL/6 background were purchased from The Jackson Laboratory (Bar Harbor, ME) and bred at the animal facilities of the Ohio State University (Columbus, OH). The production and characterization of transgenic mice (TG-B, B10.BR) expressing a rearranged TCR of a CD8+ cytotoxic T cell clone that recognizes SV40 Tag peptide 559–576 presented by the MHC class I molecule H-2Kk were described previously (44, 45). The TG-B mice were bred to B10.BR mice at the animal facilities of St. Jude Children’s Research Hospital (Memphis, TN) and Ohio State University. Mice were typed for SV40 Tag or TCR expression by isolation of mouse tail genomic DNA. The PCR-based screening assay was described previously (43, 46). TRAMP mice typing forward primer rPB.A: 5′-CCGGTCGACCGGAAGCTTCCACAAGTGAATTTA-3′; reverse primer rPB.B: 5′-AGGCATTCCACCACTGCTCCCATTCATC-3′ (43); TG-B mice typing forward primer TG-B.aF: 5′-CCCTCATTGTCCCAGAGGGAGCCATGAC-3′; reverse primer TG-B.aR: 5′-CCCCCTCCGAATGTGAGCTTGGCACCTGC-3′ (46). TG-B mice were also identified by tail bleeding and FACS analysis, by staining with FITC conjugated anti-Vβ8.1 + 8.2-specific mAb (MR5-2) and PE-conjugated anti-CD8 mAb (53-6.7; BD PharMingen, San Diego, CA). The Abs including FITC-conjugated anti-CD4 (RM4.5), CyChrome-conjugated anti-CD8 (53-6.7), PE-conjugated anti-Vβ8.1 + 8.2 (MR5-2), and purified anti-SV40 Tag (Pab 101) were purchased from BD PharMingen. Hybridoma HB224 that produces hamster anti-mouse CD11c Ab was purchased from American Type Culture Collection (Manassas, VA). The L929 cell line (H-2k) was grown in DMEM supplemented with 5% FBS, 100 U/ml penicillin, 100 μg/ml streptomycin, and 4 mM l-glutamine (Life Technologies, Grand Island, NJ). All peptides used were synthesized by Research Genetics (Huntsville, AL). The peptides were dissolved in DMSO at a concentration of 10 mg/ml and diluted in PBS or culture medium before use. Peptides used in these experiments were corresponded to SV40 Tag epitope IV 405–411 (H-2Kb restricted): VVYDFLKC (29); SV40 Tag 559–576 (H-2Kk restricted): RSEFLLEKRIIQSGIALL (45); SV40 Tag 560–568 (H-2Kk restricted): SEFLLEKRI (this report); and HSV gB peptide (H-2Kb restricted) gB498–505: SSIEFARL (47). The thymus and spleen tissues, male urogenital organ complex including prostate tissue were harvested from mice, ages ranging from 2 days to 8 wk old, as indicated in the text. Total RNA was extracted by TRIzol reagent according to the manufacturer’s instructions (Life Technologies). RNA concentration was determined and 1 μg of RNA was used to synthesize the first strand DNA by reverse transcriptase with the Superscript II kit (Life Technologies). The PCR were conducted as 94°C for 2 min, followed by 92°C for 1 min, 55°C for 1 min, 72°C for 1 min for 35 cycles and extension of 72°C for 20 min. The oligonucleotide primers were: the SV40 Tag forward primer, SV40.F: 5′-TGGACCTTCTAGGTCTTGAAAGGAG-3′; reverse primer, SV40.R: 5′-AGGACTTCCACCACTGCTCCCATTCATC-3′ (43); the ribosome L-19 forward primer, L-19.F: 5′-CTGAAGGTCAAAGGGAATGTG-3′; reverse primer, L-19.r: 5′-GGACAGAGTCTTGTGATCTC-3′ (43); the murine probasin (mPB) forward primer, mPB.F: 5′-ATCATCCTTCTGCTCACACTGCAT-3′; reverse primer, mPB.R: 5′-ACAGTTGTCCGTGTCCATGATACGC-3′ (48). PCR products were separated by 1.5% agarose gel electrophoresis, transferred to a Hybond N+ membrane (Amersham Pharmacia Biotech, Piscataway, NJ). The membrane was hybridized with DNA probes and signals were detected by ECL direct nucleic acid labeling and detection system according to the manufacturer’s instructions (Amersham Pharmacia Biotech). C57BL/6 or TRAMP mice of 8–12 wk of age were immunized s.c. with 100 μg SV40 Tag epitope IV peptide in CFA (400 μg of mycobacterium tuberculosis/ml) in a total volume of 100 μl PBS. Draining lymph nodes and spleens were isolated at 9 days after immunization. ELISPOT assays were performed to evaluate the frequencies of T cells producing IFN-γ upon restimulation with SV40 Tag epitope IV in vitro according to the manufacturer’s instructions (BD PharMingen). An unrelated H-2Kb-restricted Ag, HSV gB peptide, was used as nonspecific peptide control. Duplicates of six-point titration of different amounts of splenocytes or lymph node cells were applied to the culture containing either 1 μg/ml Ag-specific peptide SV40 Tag epitope IV or 1 μg/ml control peptide HSV gB epitope. The spots were counted under a contrast microscope. The SV40 Tag epitope IV-specific IFN-γ spots were calculated by subtracting the nonspecific IFN-γ spots produced by HSV gB stimulation from the SV40 Tag epitope IV IFN-γ spots. The results of six-point titration from different amounts of cells were plotted using Excel program and the linear range regression analysis was used to obtain the Ag-specific spots per 1 × 106 splenocytes or lymph node cells. Total spleen cells (3 × 105/well) from TRAMP × TG-B (H-2bxk) F1 mice were cultured with the given concentrations of SV40 Tag K560–568 peptide or control HSV gB peptide in Click’s Eagle-Hank’s amino acid medium for 72 h. The proliferation of T cells was determined by incorporation of [3H]thymidine (TdR) pulsed (1 μCi/well) during the last 6 h of culture. The data presented are means of duplicates with variation from the means <15%. In CTL assay, the total spleen cells from TRAMP × TG-B (H-2bxk) F1 mice were cultured in 0.1 μg/ml SV40 Tag 560–568 peptide in Click’s EHAA medium for 5 days and used as effector cells. As target cells, we used L929 (H-2K) pulsed with either SV40 Tag 560–568 peptide or control HSV gB peptide. These targets were labeled with 51Cr for 1 h at 37°C. The effector cells and target cells were added to the 96-well plate at different E:T ratios. After 6 h, the released 51Cr in the supernatants was harvested and determined by a Packard TopCount NXT Microplate Scintillation and Luminescence Counter (PerkinElmer, Downers Grove, IL). The specific percentage of lysis was calculated as: specific % lysis = [(cpmsamples − cpmmedium)/(cpmmaxim − cpmmedium)] × 100. The data presented are means of duplicates. Freshly harvested mouse thymus, spleen, and prostate tissues were snap frozen in isopentane and stored at −70°C. Five-micrometer thick sections were cut with a cryostate (Microm HM 505E; Fisher Scientific, Fairlawn, NJ) at −20°C, and frozen sections were fixed with acetone before staining with H&E. For double label immunostaining, we used VECTASTAIN Elite ABC (avidin/biotin complex) kits following the protocol provided by manufacturer (Vector Laboratories, Burlingame, CA). Briefly, the frozen sections were fixed in cold acetone and blocked with 1% H2O2, avidin-blocking solution, and biotin blocking solution (Vector Laboratories), respectively. This was followed by preincubation with 5% normal horse serum in PBS for 30 min. The sections were then incubated with mAb to SV40 Tag (Pab 101; BD PharMingen) for 1 h. The biotinylated horse anti-mouse IgG was applied to the slides as a secondary Ab, followed by application of avidin-biotin-peroxidase complex (ABC; Vector Laboratories). The Vector VIP (dark purple; Vector Laboratories) was used as first step enzyme substrate. The sections were treated with 1 N HCl for 10 min and preincubated with 10% goat normal serum for 10 min. The sections were then incubated with hamster anti-mouse CD11c (HB224) supernatant for 1 h. The biotinylated goat anti-hamster IgG (Jackson ImmunoResearch Laboratories, West Grove, PA) was applied to the slides as a secondary Ab, followed by application of ABC reagents. Diaminobenzidine (Vector Laboratories) was used as a second step enzyme substrate. All sections were counterstained in Vector’s Methyl Green Counterstain (Vector Laboratories) and then mounted with Permount histologic mounting medium (Fisher Scientific). Histological and immunostained slides were studied and photographed using an Olympus BX-40 microscope (Olympus, Melville, NY). Male TRAMP mice developed immune tolerance against the SV40 Tag as they failed to respond when immunized with SV40 Tag-transfected fibroblast B6-3T3 cells (33). As the first step to determine whether prostate expression of Tag is responsible for the tolerance, 8- to 12-wk-old male or female C57BL/6 background TRAMP mice and their Tag-negative littermates were immunized s.c. with 100 μg of MHC H-2Kb-restricted immunodominant Tag epitope IV peptide (residue 404–411; Ref. 29) in CFA. After 9–10 days, the mice were sacrificed and draining lymph node cells and splenocytes were collected. The frequency of Tag epitope IV-specific IFN-γ-producing cells were determined by ELISPOT assay. An unrelated H-2Kb peptide from HSV-1 gB peptide was used as control (47). As shown in Fig. 1⇓, Tag-negative male mice (Tag− Imm) developed a vigorous response to immunodominant Tag epitope IV, while the male TRAMP mice produced a barely detectable T cell response, consistent with prior studies that revealed immune tolerance to this epitope in male TRAMP mice (33). 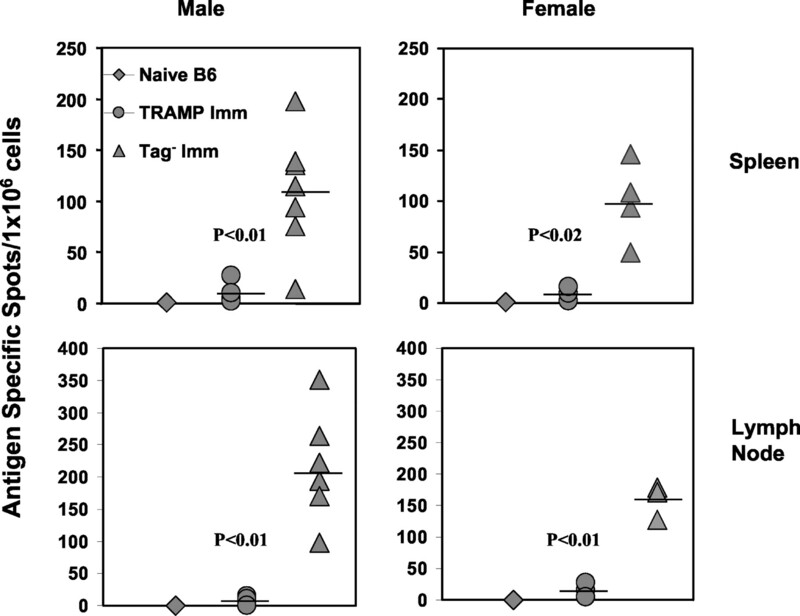 Surprisingly, the number of Tag-specific T cells was also low in female TRAMP mice in comparison to Tag-negative littermates. Thus, TRAMP female mice are also tolerant to this Ag. As expected, the numbers of Tag-reactive cells were not significantly different between male and female mice. These results indicate that expression of Tag in the prostate is not required for induction of tolerance to Tag in TRAMP mice. Both male and female mice are tolerant to SV40 Tag. Male and female TRAMP mice and their nontransgenic littermates (Tag− Imm) were immunized with the major Tag epitope. At 9 days after immunization, the spleens and lymph nodes from naive and immunized mice were harvested and Tag-specific IFN-γ-producing T cells were measured by ELISPOT assay. Six-point titrations of cells were applied to the culture in 96-well plates containing either 1 μg/ml Ag-specific peptide SV40 Tag epitope IV or 1 μg/ml control peptide HSV gB epitope. The spots were counted under a contrast microscope. The SV40 Tag Ag-specific spots were calculated by subtracting the means of correlated nonspecific HSV gB peptide IFN-γ spots from the means of SV40 Tag epitope IV peptide IFN-γ spots. Linear regression analysis on the six-point titration was used to obtain the Ag-specific spots per 106 splenocytes or lymph node cells. Data shown are summaries of three independent experiments. TG-B mice expressed a rearranged TCR from a CD8+ cytotoxic T cell clone that recognized SV40 Tag presented by MHC class I molecule H-2Kk (44). The presence of transgenic T cells can be monitored by flow cytometry with anti-CD8 and anti-Vβ8-specific mAbs. To test whether the tolerance was caused by thymic clonal deletion of SV40 Tag-reactive T cells, we bred the TRAMP mice with TG-B mice to obtain TRAMP/TG-B double transgenic and TG-B single transgenic F1 (H-2bxk) mice. The fates of SV40 Tag-specific T cells in the central and peripheral lymphoid organs were examined in the F1 mice at 25–30 days after birth. Gross anatomic examination showed that the thymi of TRAMP/TG-B double transgenic mice were wrinkled and much smaller than those of nontransgenic or TG-B single transgenic mice. This was consistent with the number of viable cells recovered from the thymus (Fig. 2⇓a). In male double transgenic mice, the total thymocytes were 1.1 × 107 cells in average compared with 6.5 × 107 cells in TG-B single transgenic F1 mice. Thymocytes were then stained with anti-CD4, anti-CD8, and anti-Vβ8 Abs and examined by three-color flow cytometry. The upper panels in Fig. 2⇓b depict the composition of the thymocytes of the male mice, while the lower panels show those of the female mice. 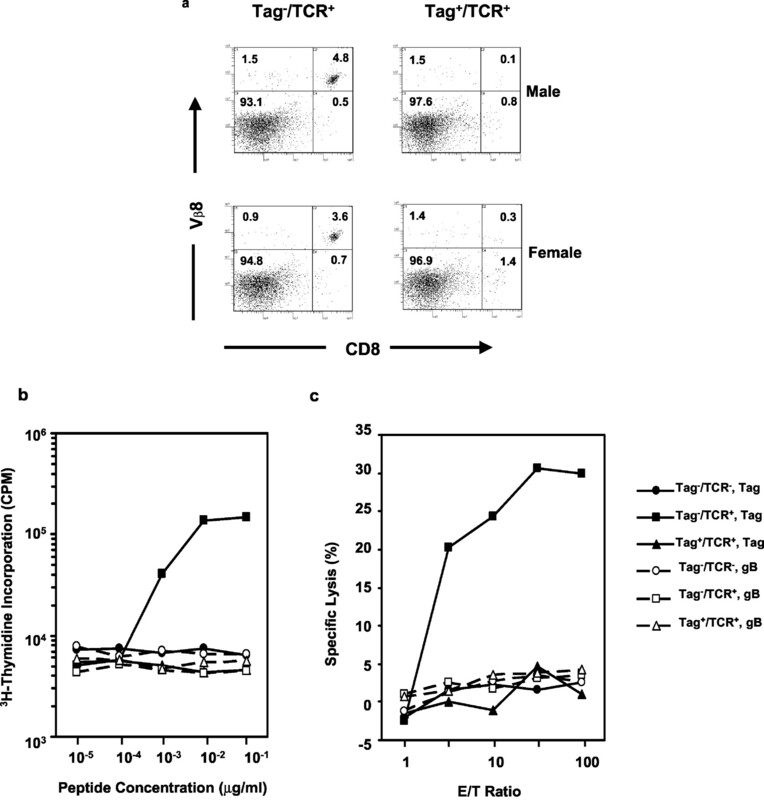 The percentages of CD4+CD8+ cells and CD8+CD4− cells were significantly decreased in TRAMP/TG-B double transgenic mice in comparison to those in TG-B single transgenic mice. The female double transgenic mice also showed a profound decrease in these two populations as the male mice did. Among the Vβ8high cells, CD8+CD4− cells were reduced by >50-fold in the thymi of TRAMP/TG-B double transgenic mice (Fig. 3⇓a). The majority (74%) of Vβ8-positive cells were CD4−CD8− (Fig. 3⇓b, upper right), which is consistent with clonal deletion occurring at early CD4+CD8+ stage of development as has been seen in other MHC class I-restricted TCR-transgenic mice (36, 37). Therefore, these data demonstrate that the SV40 Tag-specific transgenic T cells are efficiently deleted in the TRAMP/TG-B double transgenic mice. 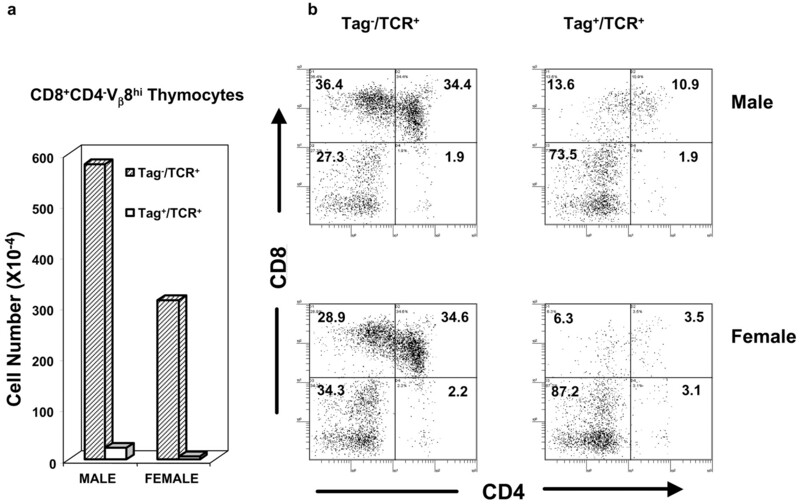 The clonal deletion in the female double transgenic mice was at least as complete as in the male mice, as suggested by severe reductions in the proportion of CD4+CD8+ and CD8+CD4−Vβ8high T cells in thymus (Figs. 2⇓ and 3⇓). Although there appeared to be more efficient clonal deletion in female mice in the experiment presented, our analysis of >30 Tag+/TCR+ mice of both sexes revealed no statistically significant difference between the two (data not shown). These results indicated that deletion of Tag-reactive T cells is independent of Ag expression in the prostate and explained the hyporeactivity of T cells in the TRAMP mice (Fig. 1⇑). Clonal deletion of Tag-specific T cells in the thymus. Thymus tissues from SV40 Tag+/TCR+ double transgenic F1 mice and SV40 Tag−/TCR+ single transgenic F1 mice were harvested at day 25 after birth. Thymocytes were stained with anti-CD4 and anti-CD8 Abs. The total thymocytes numbers (a) and the subset distribution of thymocytes (b) were presented. The numbers in the quadrants were percentages of cells. Data shown were from one representative of at least two to three mice per group in a total of four independent experiments. Numbers and phenotypes of Tag-specific T cells. Thymus tissues from SV40 Tag+/TCR+ double transgenic F1 mice and SV40 Tag−/TCR+ single transgenic F1 mice were harvested at day 25 after birth. Thymocytes were stained with anti-CD4, anti-CD8, and anti-Vβ8 Abs and examined by three-color flow cytometry. Vβ8high T cells were gated. a, Numbers of Vβ8highCD8+CD4− cells in thymus. b, The CD4/CD8 expression among the gated Vβ8high thymocytes. The numbers in the quadrants were percentage of cells. Data shown are from one representative of at least two to three mice per group in a total of four independent experiments. Corresponding to the clonal deletion in the thymus, we also found that the T cells reactive to SV40 Tag were selectively depleted in peripheral lymphoid organs. Among splenic T cells, the ratio of CD4/CD8 single positive cells was 2:1 in nontransgenic mice and 1:4 in TCR single transgenic mice (data not shown). As expected, the majority of CD8+ T cells expressed Vβ8 in the TCR single transgenic mice (Fig. 4⇓a, left panels). However, in double transgenic mice, the absolute numbers of T cells were significantly decreased and the CD8+Vβ8+ cell population was absent (Fig. 4⇓a, right panel). Numbers and functions of mature Tag-specific T cells in the spleen. Spleens from SV40 Tag+/TCR+ double transgenic F1 mice and SV40 Tag−/TCR+ single transgenic F1 mice were harvested at day 25 after birth. a, Splenocytes were stained with anti-CD4, anti-CD8, and anti-Vβ8 Abs and examined by three-color flow cytometry to detect the percentage of the Vβ8+CD8+ transgenic T cells. The numbers in the quadrants were percentages of cells. b, Proliferation of Tag-specific T cells. Splenocytes were stimulated for 66 h in the presence of Tag peptides 560–568 (solid lines) or control HSV gB peptides (dashed lines) in different concentrations as indicated, and proliferation was detected by pulsing the culture with [3H]TdR for an additional 6 h. c, The cytotoxicity of Tag-specific T cells. Splenocytes were cultured with 0.1 μg/ml Tag peptide 560–568 for 5 days. Viable cells were isolated from the interface between Ficoll-opaque solution and the medium and were used as effectors. Tag-peptide pulsed (solid lines) or HSV gB peptide (dashed lines) pulsed 51Cr-labeled L929 cells were used as target cells. Data shown are from one representative of five independent experiments. Previous mapping of the H-2Kk-restricted CTL epitope in SV40 Tag using in-frame deletion mutants mapped the epitope in the position of peptide 559–576 (45), which is significantly longer than the known size of peptides presented by MHC class I. We compared this 18-residue peptide with the consensus sequence of H-2Kk-binding peptide (50) and synthesized a 9-residue peptide (560–568) with a minimal motif, SEFLLEKRI. As shown in Fig. 4⇑b, the peptide Tag 560–568 was capable of inducing transgenic T cell proliferation from TCR single transgenic F1 mice. After 5 days of in vitro stimulation with Tag peptide 560–568, the activated transgenic T cells lysed L929 cells pulsed with peptide (Fig. 4⇑c). In contrast, the splenocytes from the double transgenic mice did not proliferate when stimulated with SV40 Tag peptide 560–568 (Fig. 4⇑b). In addition, after 5 days of in vitro stimulation, TRAMP/TG-B splenocytes failed to lyse Tag peptide-pulsed L929 cells (Fig. 4⇑c). Taken together, both flow cytometry and functional assays demonstrated that clonal deletion of CD8+Vβ8+ cells was almost complete in both male and female double Tag+/TCR+ transgenic mice. Previous studies generally support the notion that the SV40 Tag is expressed exclusively in the prostate in TRAMP mice, starting at 4 wk after birth (33, 43). However, the fact that strong clonal deletion was observed even in female mice cast doubt on the exclusivity of Tag expression in the prostate. Because we were also unable to reproducibly detect Tag expression in the thymus from the TRAMP mice by routine Northern blot or RT-PCR method, we increased the detection sensitivity by performing the RT-PCR followed by Southern Blotting. This allowed reproducible detection of Tag expression in the thymus. Contamination of DNA was excluded by two criteria: 1) the size of products were as predicted after RNA splicing (260 bp); and 2) no product of this size was detected unless the reverse transcriptase was used. The PCR products were sequenced to confirm the correct splicing form of Tag. As shown in Fig. 5⇓a, by using this detection method, we were able to reproducibly detect SV40 Tag expression in the thymus as early as 2 days after birth. Before puberty, we found that the SV40 Tag expression level was higher in the thymus than that in the prostate gland (Fig. 5⇓b). The SV40 Tag expression increased >1000-fold in the prostate gland after puberty, which was consistent with the androgen-mediated activation of probasin promoter (49). 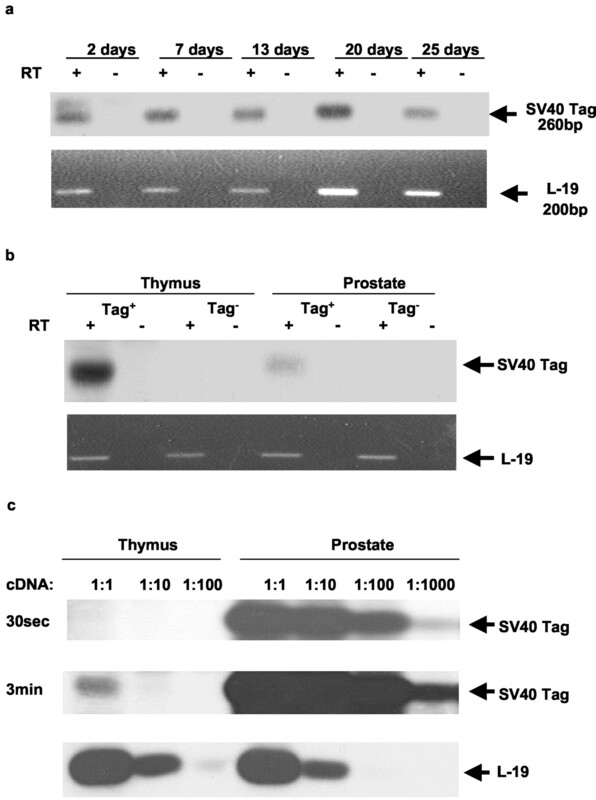 Interestingly, the thymic expression of SV40 Tag was not augmented in this process (Fig. 5⇓c). Thus, thymic and prostatic Tag expressions were differentially regulated. As such, different molecular mechanisms may be responsible for thymic expression of the Tag gene. SV40 Tag expression in the thymus tissues and in the prostates as detected by RT-PCR followed by Southern blot. a, Expression of SV40 Tag mRNA in thymus from mice of various ages. The first strand DNA (RT+) and RNA (RT−) were used as templates and primers for either Tag (35 cycles) or control L-19 gene (25 cycles) were used for PCR. RT-PCR results of L-19 amplification were shown as agarose gel image. The SV40 Tag PCR products were separated by agarose gel electrophoresis and transferred to the Hybond N+ membrane. The membrane was hybridized with HRP-labeled probe and signals were detected by use of an ECL direct nucleic acid labeling and detection system. b, Comparative analysis of Tag mRNA in thymus and prostate of prepuberty mice (25 days). c, Comparative analysis of Tag mRNA in thymus and prostate of postpuberty mice (8 wk). The first strand DNA was diluted as indicated and PCR were conducted, the SV40 Tag PCR was 35 cycles, and the L-19 PCR was 15 cycles. Both PCR products were subjected to Southern blotting by ECL method described above. The films were exposed for either 30 s or 3 min for SV40 Tag, and 10 s for L-19. The low levels of Tag expression in the thymus can be due to either poor expression on a large number of cells, or high expression on a small number of specialized cells. To address this issue, frozen sections of TRAMP mouse thymus were immunostained with anti-Tag Ab Pab101 that reacted with the Tag located on nucleus and anti-CD11c Ab that stained the cell membrane. Examples of Tag-expressing cells were shown in Fig. 6⇓. Some cells that express SV40 Tag also express CD11c, a marker for dendritic cells (DCs) (Fig. 6⇓a, arrow). However, >95% of the DCs did not express Tag. A higher number of Tag expressing cells were not stained with anti-CD11c (Fig. 6⇓, b and c), which indicates other cell types also expressed Tag. Moreover, while the majority of the Tag+ cells were located in the medulla, some were scattered in the cortical-medullar junction region and cortex (data not shown). The presence of the Tag+ cells at multiple sites might explain the strong clonal deletion of Tag-specific T cells starting at the CD4+CD8+ stage. Detection of Tag expression in DCs and non-DCs in the thymic medulla. The frozen sections of TRAMP mouse thymic tissue were double immunostained with anti-SV40 Tag Ab (Pab101; Vector VIP as substrate) and anti-CD11c (diaminobenzidine as substrate). The slides were photographed with an Olympus BX-40 microscope under ×100 objective. Three representative Tag+ cells are shown. a, A CD11c+Tag+ cell (arrow) together with a CD11c+Tag− cell. b and c, Two examples of Tag-expressing cells (arrows) that are not expressing CD11c marker. 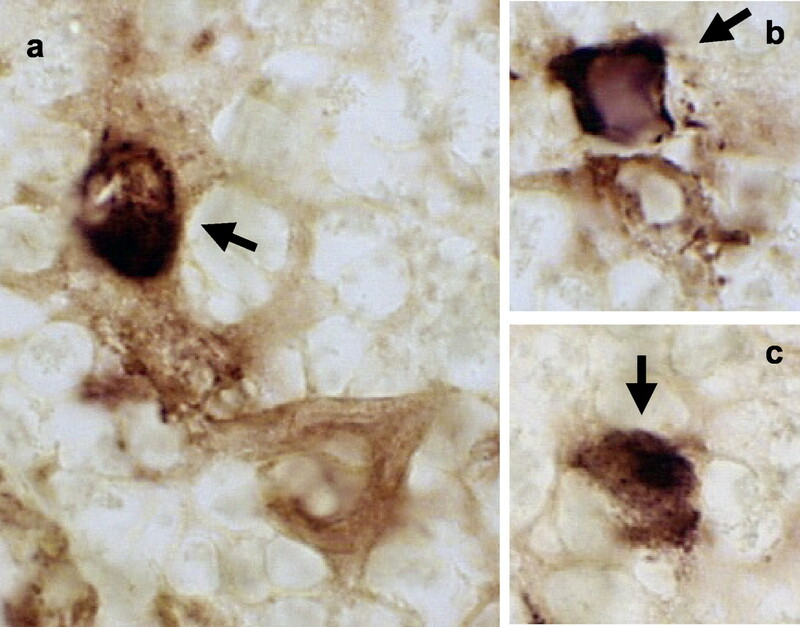 All examples are taken from thymic medulla, although both CD11c+Tag+ and CD11c−Tag+ cells can also be found at cortex and cortex-medulla junction areas (data not shown). To rule out the possibility that expression of Tag is an artifact of the transgene, we also tested if the endogenous probasin is expressed in the thymus. mPB has been cloned and its expression has been shown to be prostate-specific (48). Using the same RT-PCR plus Southern blot method, we found that mPB mRNA was detectable in the thymus of TRAMP mice before puberty (25 days after birth), although the mPB expression was much stronger in the prostate (Fig. 7⇓). Thus, expression of Tag is not a transgenic artifact; and therefore, is representative of prostate-specific genes. The thymic expression of murine probasin. RT-PCR followed by Southern blot was conducted in the RNA sample isolated from a 25-day-old TRAMP mouse. With exceptions of the primer and probe used, the experiments were performed as described in Fig. 5⇑. The control housekeeping gene L-19 expression and murine probasin expression in prostate were shown as agarose gel images, while the murine probasin expression in thymus was shown as PCR-Southern blot ECL film image. It has been reported that in TRAMP mice, T cells specific for SV40 Tag are tolerized (33). However, the mechanisms for the tolerance were not elucidated. In this study, we used what is now a classical double-transgenic approach to demonstrate that the Tag-specific T cells are deleted in the thymus. Because the Tag is expressed in the thymus, the simplest interpretation is that Tag expressed in these cells is directly responsible for clonal deletion, although it is still possible that the cell-mediating clonal deletion acquires Tag expressed elsewhere via cross-presentation. Nevertheless, equally efficient clonal deletion in female mice excluded the possibility that the prostate is the donor of this Ag. This finding, together with the lack of effect of puberty on the expression of Tag in the thymus, support the general hypothesis that distinct molecular mechanisms are responsible for the thymic expression of peripheral Ag (51). It is worth noting that several groups have failed to detect Tag expression by both Northern blot and RT-PCR (33, 43). Although we have had similar experiences with these methods, we were able to detect Tag after we used Southern blot to increase the sensitivity of detection. The requirement for an additional step to reveal the Tag product suggests that the Tag is expressed at low levels in the thymus. However, immunohistochemistry revealed that the overall low abundance of Tag mRNA in the thymus is likely due to a small number of Tag-expressing cells. The significant levels of Tag expression among the cells known to be involved in clonal deletion (DCs in medulla and the cortical medulla junction) support their role in deletion of the Tag-specific T cells. Expression of Tag in a small number of cells in the thymus is not surprising. Tag, under the control of other tissue-specific promoters, such as rat insulin promoter for pancreatic islet β cell expression (52, 53) and elastase I promoter for pancreatic acinar cell expression (54), was also reported to be expressed in the thymus. The expression of Tag was not a transgenic artifact as many other peripheral Ag gene transcripts were also found in the thymus. These include pancreatic and thyroid hormones, neuroendocrine molecules, and other proteins (52, 53, 55, 56, 57, 58, 59, 60, 61, 62). In some cases, these proteins can become target autoantigens in autoimmune diseases. These observations led Hanahan (51) to propose a specialized population(s) of cells in the thymus that expresses Ags previously regarded as tissue-specific, which were termed peripheral Ag-expressing (PAE) cells. However, while thymus transplantation studies implicate a role for PAE cells in inducing tolerance (52, 54), clonal deletion has not been clearly established in transgenic mice expressing both TCR and the Ag in PAE cells (54, 63). The failure to observe consistent tolerance was attributed to low number of PAE cells (estimated to be within 100–300/thymus or ∼1 cell/thymic section). To our knowledge, our study is the first example using TCR transgenic model to show complete clonal deletion in the thymus that may be attributable to expression of Ag in PAE cells. It has been recently reported that thymic stromal cells, especially medullary epithelial cells, promiscuously express various tissue-specific genes (57, 62, 64, 65). However, other investigators support the view that bone marrow-derived APCs, such as DCs and macrophages, may play a key role in inducting immunologic tolerance and expressing self Ags (55, 58, 66). Our findings on double-immunohistochemical staining on Tag Ag and CD11c appear to indicate that the two schools of thought are not mutually exclusive. There is evidence that both bone marrow-derived APCs and thymic epithelial cells express self Ags with tissue-restricted expression in the thymus, although it is not clear whether their roles in central and/or peripheral tolerance are complementary or redundant. In several Tag-induced spontaneous tumor models, including cancers developed in the liver (30), brain (31, 67), bone (32), and prostate (33), it has been reported that active immunizations failed to induce protection. Correspondingly, T cell response to immunization by various forms of Tag was either absent or of extremely low avidity (30, 31, 32, 33). Because transfer of either naive or activated T cells from Tag-negative mice provided partial or full protection, T cells in these various Tag-transgenic mice must be rendered tolerant to Tag. In the case of Tag-induced pancreatic cancer, the tolerance of T cells (35), and perhaps as result of which, the effect of active immunization was determined by the timing of Tag expression (34). Theoretically, immune tolerance can be achieved centrally in the thymus, or in the periphery, by either clonal deletion or by functional inactivation. The identification of thymic expression of the Tag in some transgenic mice has provided strong argument for a role of central tolerance (34, 53). However, due to the low frequency of Ag-reactive T cells in normal mice, previous studies have not clearly established whether the transgenic Tag can induce central or peripheral tolerance and whether clonal deletion or functional inactivation is responsible. The class I-restricted SV40 Tag-specific TCR transgenic mice, developed by Geiger et al. (44), provided a valuable tool to address this issue. However, these mice had been used mainly to reveal nondeletional mechanisms (44, 54, 68). In this study, we presented clear-cut evidence that clonal deletion can be induced by the oncogene previously thought to express in tissue-specific fashion. It is well-documented that Ags that are ubiquitously expressed, such as H-2 (37) and H-Y Ag (36, 69), can induce clonal deletion of MHC class I-restricted T cells. Our work extended these findings into peripheral Ags that can be expressed by the so-called PAE cells in the thymus. Because unmutated tumor Ags are present in a high proportion of cancers of the same histological origin as well as those that are from different lineages (1, 2, 3, 4, 5, 6, 7), these Ags are the primary targets for immunotherapy. The nature of T cell repertoire to unmutated Ags is of both fundamental and practical significance. Using mice transgenic for a TCR specific for unmutated tumor Ag P1A, Sarma et al. (19) reported that P1A-specific T cells are not deleted in wild-type mice with a low expression of P1A. At face value, this appears contradictory to the finding with Tag-specific T cells, as reported in this study. However, it is important to bear in mind that P1A-specific TCR was isolated in a CTL clone from mice that express the P1A gene (1, 19, 70). The very fact that these T cells can be produced indicates that this TCR is not deleted in wild-type mice. As such, the previous work did not address whether the repertoire of T cells specific for unmutated tumor Ags has been shaped by negative selection in the thymus. In contrast, the TCR for TG-B was isolated from mice that do not express Tag (45). Therefore, the transgenic T cells are representative of unpurged Tag-specific T cells and can be used to address whether Tag expressed under a prostate-specific promoter can significantly alter the Tag-specific T cell repertoire. Our results revealed almost complete deletion of Tag-specific T cells in TRAMP mice. Obviously, in mice with polyclonal TCR repertoire, some T cells may escape clonal deletion. However, since clonal deletion removes T cells with high-affinity TCR for the Ag in the thymus (71), it is likely that high-affinity Tag-specific T cells are removed from the naive T cell pool in the TRAMP mice. Thus, strategies for immunotherapy of prostate cancer and other cancers targeting unmutated tumor Ags must take into consideration that the T cell repertoire have been depleted of the T cells of the highest affinity. In this regard, recent studies have demonstrated that supraagonist antigenic peptides or subdominant epitope may help to overcome this problem (14, 18, 72). Alternatively, one may attempt to prevent the deletion of T cells with high avidity for tumor Ag. It was realized recently that de novo production of T cells lasts throughout much of an organism’s life span (73, 74). This raises an interesting possibility that strategies aimed at preventing the deletion of tumor Ag-specific T cells will have a positive impact in cancer immunotherapy. We thank Jennifer Kiel and Lynde Shaw for the editorial assistance, and Dr. Peishuang Du for genotyping the mice. ↵1 This work was supported by grants from National Institute of Health (CA82355, CA69091, and CA58033), Department of Defense Grant DAMD17-00-1-0041, a seed grant from the Ohio Cancer Research Associates, and by the Ohio State University Comprehensive Cancer Center. ↵3 Abbreviations used in this paper: Tag, large T Ag; TRAMP, transgenic adenocarcinoma of mouse prostate; PAE, peripheral Ag-expressing; DC, dendritic cell; mPB, murine probasin.